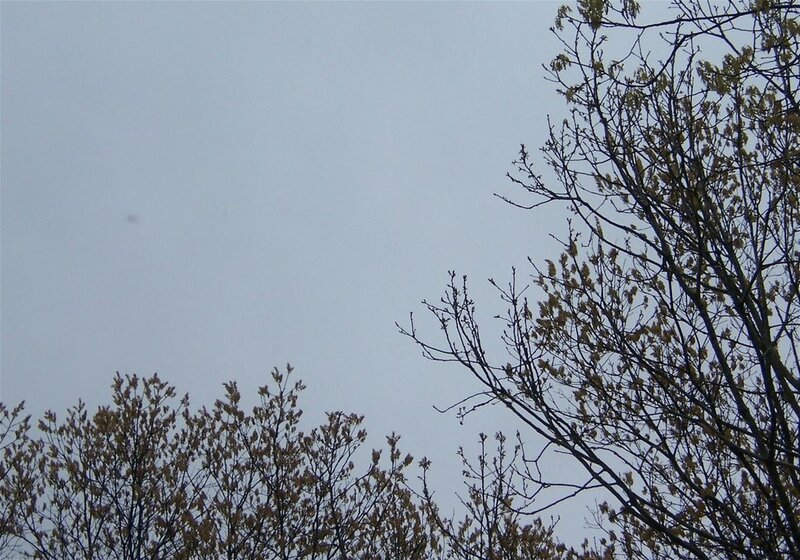 Dreary. There’s no better word for the weather today. 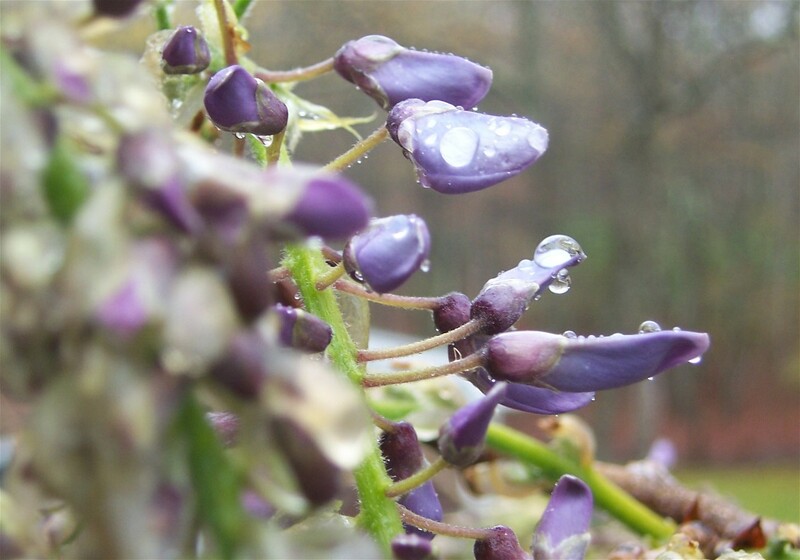 All this rain is good for something, at least: wisteria buds! It’s cold, though. It was a good day to curl up with a new sock. This is Susan Lawrence’s Sixth Sense pattern from the Six Sox Knitalong. I joined up a while back, promptly forgot about it, and then this interesting pattern started to show up in knitblogland. 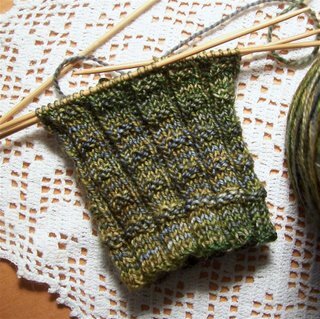 I’m looking forward to working the short-row garter stitch heel. The yarn is Fleece Artist Merino in a colorway called “Paris Dream.” It’s a good Project Spectrum color, too! I was going to work the hemmed cuff that was called for, but I messed up, so I just did the alternate cuff instead. I was in a hurry, I guess. I’m happy with it, and it will probably fit me better than the other cuff anyway. Well, that’s about it for the knitting. I’ve been so busy at work that I haven’t had the energy to knit much in the evening. Tonight I’m going to work on the cotton clapotis scarf, and I hope to have it done by the end of the weekend. I’d better finish it, since I’m taking it to Chicago on the 12th! So am I going to miss out on the Yarn of My Dreams because I can’t go to the Sheep and Wool Festival? Will I mope through the weekend because I’ll be missing all the fun? I had a booth there for many years, by myself and with Moonflower Studios. I’ve seen it all, even though I haven’t been in a long time. The weather, the crowds, the intensity — they lure and repel in the same motion. I’m having pangs of nostalgia, nothing more. No, I think I am content to wait until Rhinebeck, when our gang of girls will have a slumber party, and we’ll stroll the aisles, and we’ll laugh and have adventures. Oh, and we’ll shop for yarn and fiber, too! I really love the texture of that ribbing Jane, and the colors, too. Beautiful yarn.. I had wondered if you might be coming but since you didn’t mention it I sadly surmised that you wouldn’t.I’m mighty sorry for that because Rhinebeck always falls on an important anniversary so unless I can convince BD to spend that day in New York one year, I doubt I’ll ever get to it.How I shall miss you this year – but happily, the retreat is in NY this fall. Much easier for you to get to, no? You’re coming to Chicago? If you make it out to the western burbs, stop by my store! Let me know if you want an address. Fabulous socks! The yarn is just gorgeous.